Democratic New Hampshire Primary: Can Hillary Clinton win? 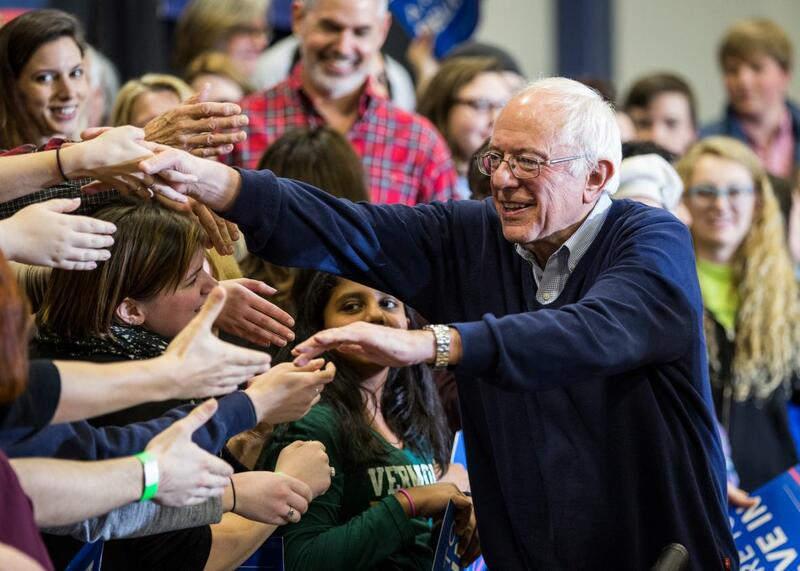 Bernie Sanders shakes hands with audience members after speaking at a campaign rally at Great Bay Community College on Feb. 7, 2016, in Portsmouth, New Hampshire. RealClearPolitics rolling average: 53.9 percent—up 4.6 points since the start of the year, but down 1.6 points since the day of the Iowa caucus. FiveThirtyEight chances of victory: >99 percent. RealClearPolitics rolling average: 40.7 percent—down 2.8 points since the start of the year, but up 3.2 points since the day of the Iowa caucus. FiveThirtyEight chances of victory: <1 percent. Those numbers suggest Clinton has almost no shot at leaving the Granite State with anything looking like a victory, moral or otherwise. Still, while Sanders is the clear favorite, I will note that eight years ago state surveys showed Barack Obama with an 8-point lead on Hillary in the days before the New Hampshire primary. When the counting was over, though, Clinton came out on top by 2.6 points. There’s a reason they count the votes. I’ve seen no evidence that Hillary is due for a repeat performance this year, but if she does pull the victory out of nowhere, it could be a fatal blow to Bernie’s candidacy. He has the money and motivation to fight on, but if he can’t win in Iowa or New Hampshire—where the Democratic electorate skews white and liberal—it’s unclear where he can, with the exception of his home state of Vermont. Clinton’s rewards, meanwhile, would be maximized, given this is the one contest on the map where she looked the most vulnerable to Sanders’ particular charms. If she can beat Bernie in New Hampshire, she can beat him everywhere. If we believe the polls, though, the real question isn’t whether Bernie will win, but instead by how much. Team Clinton has done everything it can to downplay her chances in the state, reminding anyone who will listen of Bernie’s near-native-son status there and the electorate’s history of siding with fellow New Englanders. That she hasn’t been reliving her 2008 performance on the stump every chance she gets suggests she’d rather keep expectations low to limit the political damage of a loss than try to energize her supporters in the hopes of an upset. That makes sense, since she remains the favorite in the next two contests—Nevada on Feb. 20 and South Carolina on Feb. 27—where the Democratic electorate is more diverse and moderate than in the first two contests, and given how much the media loves to play the expectations game. Still, while Bernie would benefit more from a blowout and less from a close call, ultimately the margin of victory is likely to matter far less than the victory itself. Assuming Clinton can’t deny Sanders a clear-cut win in New Hampshire like he did to her in Iowa, Hillary should prepare for a rough few days—regardless of whether she loses by 7 points or 17. Bernie will spend the next week and a half before Nevada with the momentum and the media’s attention. He’d still need to make inroads with the black and Hispanic voters that give Hillary a major advantage in the contests to come, but a New Hampshire victory would give him a bigger platform from which to make that pitch. Clinton, meanwhile, would have to deal with talking heads, everywhere from Fox News to MSNBC, wondering aloud whether she is doomed to relive her 2008 nightmare. That’s not to suggest that winning New Hampshire will make Bernie the favorite to win the Democratic nomination—it wouldn’t. But Bernie’s path to the nomination was always going to be incredibly narrow. The most important thing for him on Tuesday is that he stays on that path.